Chicken coop sanitation is one of the biggest frustrations ChickenCoopGuides.com readers seem to face. In fact, it’s the second most common concern we hear about– right after protecting the flock from predators. This approach involves providing a thick layer of bedding which provides material for the chickens to constantly dig through. In the process the chicken’s droppings are incorporated and ultimately composted. Author and organic farmer Joel Salatin provided a guest post on the Murray McMurray website with detailed information on how to use this method to keep your own coop and run clean. I have had the opportunity to meet Salatin and read several of his books. I am always impressed with his ability to find the most simple and sensible solutions to farming challenges. You can read his article by clicking here: Deep Bedding Alternative for Cramped Spaces. What tricks have you found to keep your coop clean? Do you have any other chicken raising tips to share with our online community? We’d love to hear from you! Just send us an e-mail. These blazing hot July days may just have your chickens looking for cover for a couple of reasons. And if your hens range far from the coop it’s a good idea to provide some temporary shelter. This is especially important if you have large open spaces without bushes, vehicles, or anything else your chickens can quickly duck under. You’ve probably considered the obvious need for shelter from the hot summer sun. 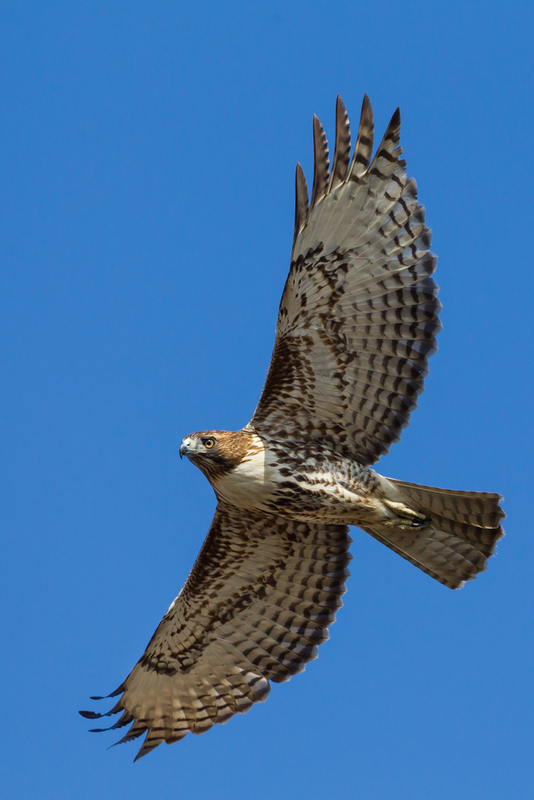 But in some areas this may be even more important because the overhead predator threat may increase this time of year. This is especially true in our high-desert climate in western Idaho where it’s common to see birds of prey circling in the distance. Early in the year the land offers an abundance of gophers, but after several days of triple digit heat those little guys have the good sense to burrow into the ground and hibernate. Once they’re gone I want to make sure my hens have plenty of opportunities to duck for cover at the first sign of a hawk. This is especially important when I have white chickens or other colors that don’t camouflage well in the landscape. One simple and inexpensive solution is to grab a few five-gallon buckets and a piece of plywood. Space the buckets about three-foot apart to form a frame for the plywood and place it on top. Here’s hoping you and your chickens stay cool! Ok… so your chickens would probably just peck on a notebook, but I’m serious about the need for some solid coop related bookkeeping. At times I like to use a notebook using the bullet journal method to keep track of coop happenings. When I have more complex or business related farm activities to track I use an Excel file for my chicken coop records related. What’s important is to have a method to constantly take note of the good, bad, and ugly happenings in each season. Some of the things I find helpful to track include the hatch date of my chicks, types and amount of feed consumed, egg production, and any flock sickness or deaths. I also like to track infrastructure problems for each season. This is especially important when starting out on a new place like we did last year. Each season produced its own surprises. In the spring sudden changes from cold and windy to hot and sunny called for more insulation and a better brooder for young chicks. In the Fall our heritage breed roosters suddenly reached an age where they needed a lot more space to coexist. And, well, this winter was a doozy. With record snowfall and following a series of ice storms I found myself struggling to walk on— then breaking through— an ice crust several inches thick with more than two feet of snow beneath that. A trip to the feed storage shed that seemed handy for the past ten months was now an epic journey. Are you planning some improvements to your chicken raising set-up this year? Or do you have a chicken raising tip to share with our online community? We’d love to hear from you! Just send me an e-mail. Backyard chickens make great pets. They are surprisingly intelligent and sociable. They are easy to care for. They eat pesky insects and table scraps, and they are a great source of food themselves, whether you raise them for eggs or meat. However, these birds need more than just table scraps and insects to be healthy and productive. 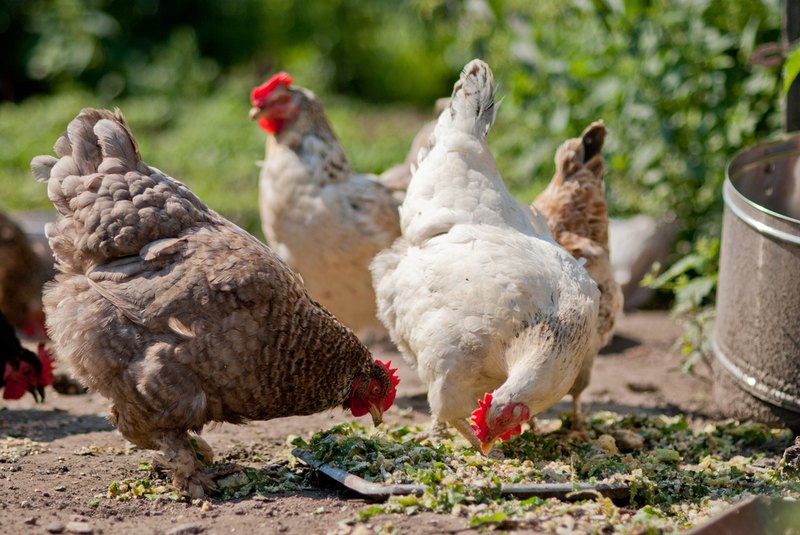 Learn what to feed backyard chickens at each age and stage. Chick feed comes in two types: mash and crumbles. They are equally beneficial. Vaccinated chicks should be given non-medicated feed. For birds that have not been vaccinated, medicated feed can guard against illness. 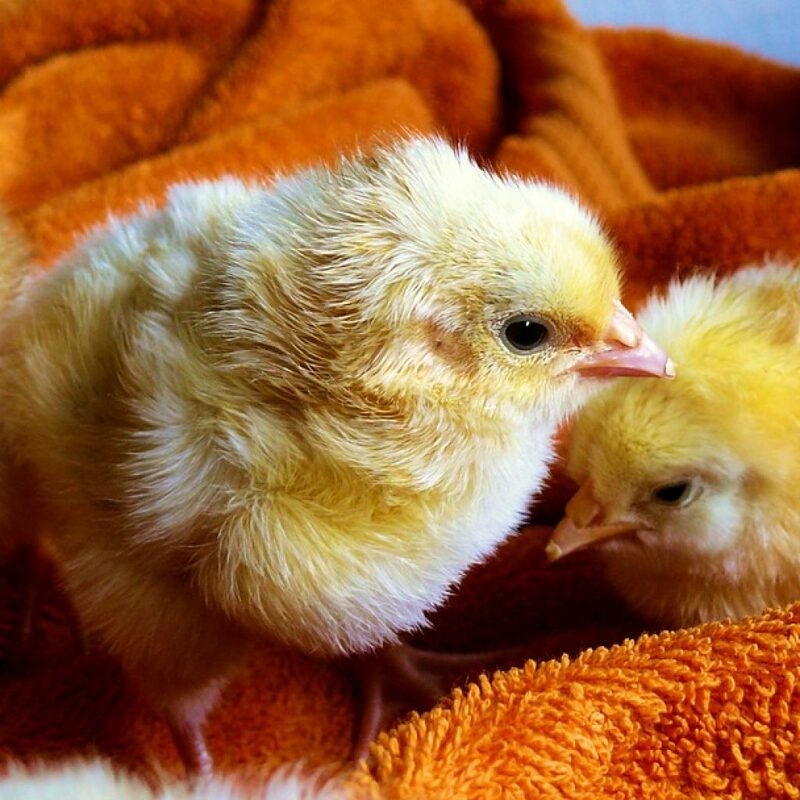 If your chicks will be meat birds, they’ll need a high concentration of protein in their diet. 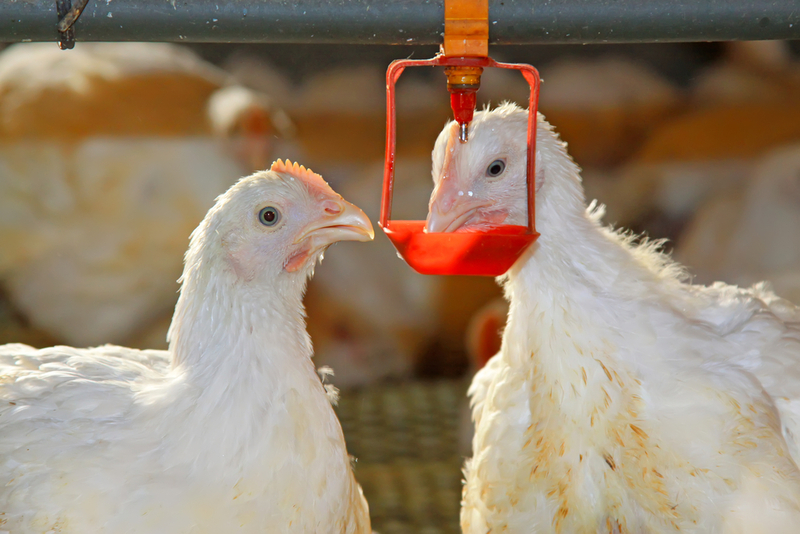 Choose a feed that is 22-24 percent protein, called “meat bird starter” or “broiler starter.” Chicks destined for laying should be given a lower protein feed, no higher than 20 percent. Chicks can be given starter feed until they lay their first egg. After that, they need extra calcium to create eggs with strong, healthy shells. Switch to calcium-enriched layer feed or supplement all-flock feed with ground oyster shell, limestone or eggshells. Non-layers, including meat birds and broody hens, should not be given layer feed or added calcium, as it can cause gout, kidney damage and other health problems. Broilers, also known as meat birds, need extra protein right from the start to grow to a satisfying size for eating. Chicks should be given unlimited starter feed for three to four weeks, then switched to adult meat-bird pellets. Once they’ve graduated to adult food, allow them free access to unlimited feed for 12 hours a day, and then remove the feed for 12 hours. Meat birds need to consume a lot and will eat more feed each week as they grow. Chickens are omnivores and enjoy a wide variety of foods, including grains, fruits, vegetables, insects, and even snakes and lizards. They have a natural instinct for scratching, and grains can be scattered in the yard for a fun activity that yields a special treat. They also enjoy table scraps, chicken scratch and mealworms, though these snacks should make up no more than 10 percent of their daily calories. Fortunately, most kitchen scraps are perfectly safe for chickens. Stale, wilted and overripe foods are all acceptable; moldy food is not. Citrus fruits, garlic and asparagus won’t hurt your chickens, but they may taint the flavor of the eggs and should be limited. Chickens also need grit to help them digest their food. If they are allowed to roam and scratch in an area with dirt, gravel or sand, this can satisfy that need. Otherwise, you may need to add grit to their feed or sprinkle some with their scratch. Backyard chickens are easy to feed and easy to care for. If you’re ready to start a flock of your own, we can help you get started. Download our free guide to building your first chicken coop, then select a plan that suits your needs. You’ll be amazed at just how rewarding backyard chickens can be! Winter can be a rough time of year for everyone, including your chickens. Chicken pecking (where your formerly docile hens start taking a bite out of their neighbors) is one problem likely to arise when environmental stimulation is at a low point. You can prevent excessive boredom in chickens by making a few strategic changes to their habitat. Because boredom can lead to depression, irritability, egg eating, and a range of other behavioral problems, planning ahead to prevent this problem can make winter a much easier season for everyone. Physical activity is one of the best boredom busters for chickens and people alike. In the cooler months, chickens are less likely to stick with their normal busy schedule of scratching and walking about. Give them a little motivation to stay active by covering up the cold ground with some fresh straw. Ground cover protects their feet from getting too chilly and will encourage more daytime activity. Simply strew straw over the rocks and dirt that are within their usual area of activity. Leaves and pine needles are other great ground cover ideas. Chickens will readily walk on this insulating layer and will likely find a few hidden snacks, too. A new variety of perches is another great way to encourage activity during cold weather. Arrange perches at different heights or try switching up the material that the perches are made of. These can be placed anywhere your chickens are likely to spend time. Cabbages are excellent food sources for chickens, providing lots of vitamins and other nutrients. To make a cabbage tetherball, simply tie a string securely around a cabbage and suspend it a short distance above beak height. This way the chickens will have to work just a little bit to get those tasty greens. Create quiet spaces for chickens that prefer alone time by propping tilted boards or pallets against vertical surfaces. Corn and other chicken treats add some exciting variety, and provide a distraction from chicken pecking, but these snacks should be provided in moderation. Chickens can easily gain too much weight in winter as a result of decreased activity. A sprinkling of dried corn is all that is needed to cause quite a bit of activity each day. Like all birds, chickens like to have space to spend quiet time alone. 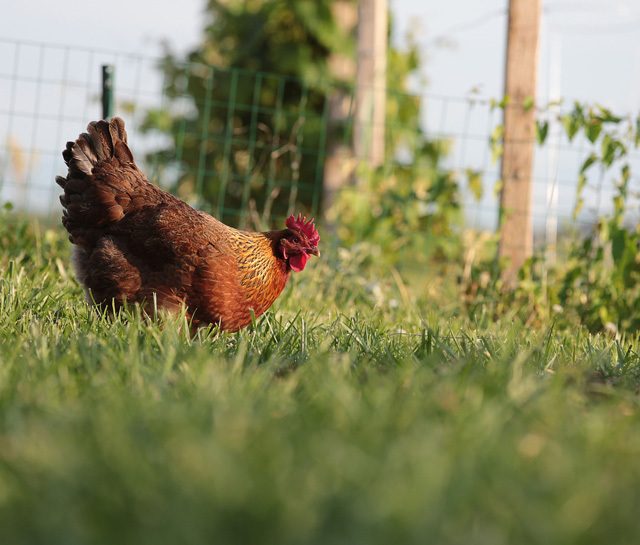 Coops and runs can get a little claustrophobic in cold weather, so adding some variety to that environment will help create new spaces for quiet rest. New perches and other interesting features will help encourage healthy activity and deter boredom and chicken pecking. 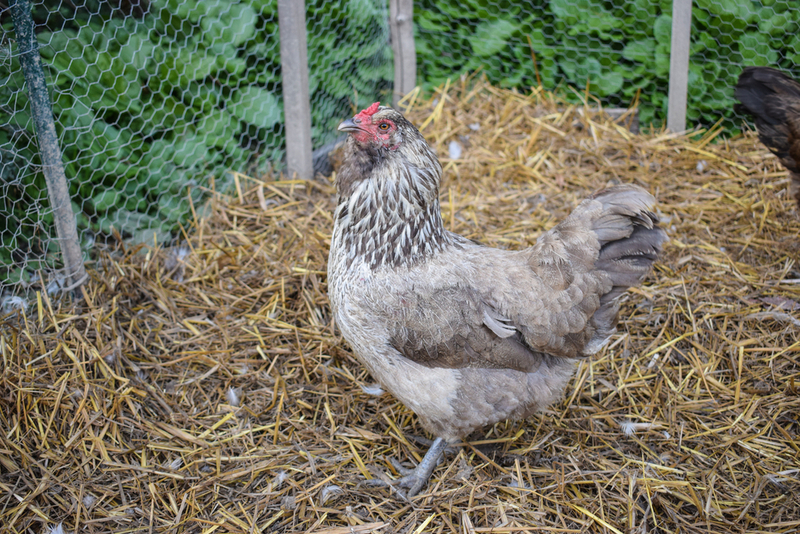 Plan ahead to keep your chickens happy and stimulated this winter.